Since 1996, seven states have implemented assisted guardianship child welfare waiver demonstration projects: Delaware, Illinois, Maryland, Montana, New Mexico, North Carolina, and Oregon. These projects allow states to spend federal funds normally reserved for foster care and adoption subsidies to provide monthly subsidies to families that assume legal guardianship of children previously in the foster care system. Increasingly, guardianship is being embraced as an appropriate permanency option for children in foster care, especially for children placed with relatives, who cannot be safely reunified with birth parents and who cannot or do not wish to be adopted. An independent evaluator evaluated each of the state guardianship projects. 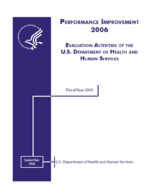 This report reviews and synthesizes process and outcome findings from each of those evaluations and presents crosscutting lessons learned. Among the key findings presented is that in Illinois, the state conducting the largest demonstration, the availability of assisted guardianship increased overall permanency rates by a statistically significant 6.1 percent. Several state evaluations presented quantitative and/or qualitative data indicating that children in guardianship did as well as adopted children on measures of child safety, stability, and well-being, and that both youth and their caretakers identified significant advantages of guardianship over continued stays in foster care. Another lesson learned by two states is that the amount of the guardianship subsidy matters. Many caregivers either cannot or will not absorb a decrease in financial resources, meaning that to be successful, guardianship subsidies must be comparable to foster care maintenance payments and/or adoption assistance subsidies.